You would think that having recordings of both Vivaldi operas bearing the name of Orlando Furioso that that would be enough, but not at all. Here we have a wonderful Blu-ray presentation of the later and more famous version of the opera from 1727, which is sometimes just called Orlando. 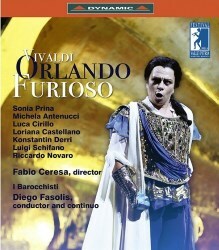 The opera is based upon much the same story as the earlier version, with a libretto by the Italian jurist and poet Grazio Braccioli, which he based upon Ludovico Ariosto’s romantic epic Orlando Furioso. Although the time and place of the action is not stated, it is clear that it takes place in a romanticised medieval period and deals not only with the exploits of Orlando, but also those of the sorceress Alcina. The opera exploits various plotlines, with Act I opening in a beautiful and idyllic garden where Medoro, aided by Alcina, has evaded his captors and a shipwreck, to be reunited with his love Angelica. Orlando, who is also in love with Angelica, becomes jealous of Medoro, but is appeased by Angelica who says that he is her brother. At the same time Alcina is in love with Ruggiero and uses magic to entrap him. In Act II Alcina tricks Orlando into going to fight a monster whixch guards the elixir of youth, while Medoro and Angelica state their love for each other. Orlando discovers Angelica’s infidelity after he is magically trapped in a cave; whilst he is digging his way out of the trap, Medoro and Angelica are married. Orlando discovers this after reading the vows of Medoro and Angelica which they have carved into a nearby tree, Orlando becomes filled with rage over the deception and destroys the tree along with others. The final act revolves around the Temple of Hecate, the seat of Alcina’s power; here Ruggiero and Bradamante plot against Alcina and await her return to the Temple, where her power is secretly held within a vessel. As part of the plot Bradamante disguises herself as a man and Alcina falls in love with her at first sight. Orlando appears, still in a rage about the wedding of Medoro and Angelica and fights the Temple’s statues that have been magically brought to life by Alcina; during the fight he unknowingly breaks a vessel and therefore destroys the power of Alcina. After the fight Orlando goes off to sleep. Alcina, bereft of her power seeks to kill him, but before she has a chance to do so she is intercepted by Ruggiero and Bradamante, before Astolfo arrests her. After his sleep Orlando awakes and due to Alcina losing her power, he has come to his senses, as a result he forgives Angelica for her infidelity and her subsequent wedding to Medoro. This is a very good performance, one which gets an opulent production and one that benefits from a good roster of vocalists and some excellent ensemble pieces. Whilst the singing might not be as secure as on the Naïve CD set (OP30393), this is more than made up for by the exciting and engaging performance. The production boasts some wonderful performances led by Sonia Prina as Orlando; hers is an engaging and well-sung performance, whilst her stage presence is very good indeed. I enjoyed Lucia Cirillo’s spirited performance as Alcina, she acts the part of the sorceress with aplomb, whilst Michela Antenucci and Konstantin Derri are well matched as the lovers Angelica and Medoro. Luigi Schifano as Ruggiero and Loriana Castellano as Bradamante are also very good, especially as their plot against Alcina unfolds, as is Riccardo Novaro as Astolfo. If not the very best, this is a well-sung performance, something which is greatly enhanced by the acting ability of the soloists. The chorus is in fine voice whilst the instrumental ensemble, I Barocchisti, and their director, who also performs the continuo part, deserve a special mention for their spirited performance; they drive the action forward with their excellent playing. The opulence of the set and the costumes deserve a mention with Fabio Ceresa’s production being a feast for the eyes as much as for the ears; this contributes greatly to the overall feel of the performance. The recorded sound is very good and considering that this is a live performance there is very little drop in audibility as the performers move around the stage. It is well lit, whilst the camera angles and video direction of Matteo Ricchetti are very good. The booklet, in Italian and English, contains some historical and production information, as well as a detailed synopsis. The in-picture subtitles are good, with the overall effect being very pleasing, making a welcome addition to my collection of Orlando Furioso performances.